Bill Brosseau received his education from the University of California at Davis Viticulture and Enology program. He worked at several wineries before settling at Testarossa Vineyards in the Santa Cruz Mountains. He is also the winemaker for Fleming Jenkins and Blackridge Estates and consults for vineyards and wineries. Bill's wife, Kilene, is also a graduate of University of California at Davis Viticulture and Enology program and assists in the operations of the vineyard and winery. 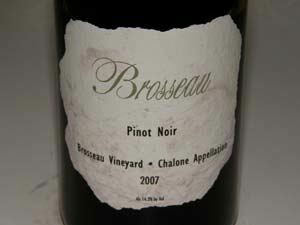 Small lots of Brosseau Vineyard Chardonnay, Pinot Noir and Syrah are produced (Chalone appellation). The wines are sold through a mailing list with some retail distribution.